It’s ITALIA Season on the Daily Norm, and after a week of Norms’ adventures down the boot of Italy, and a showcase of my photos of the glorious country, it’s time to feature another of my paintings. I haven’t devoted nearly as much canvas space to Italy as I have to Spain or Paris for example. And now I come to think about it, that really should change. There is frankly so much beauty to inspire me that I could paint Italy for the rest of my life. Perhaps that’s why I have never really begun. 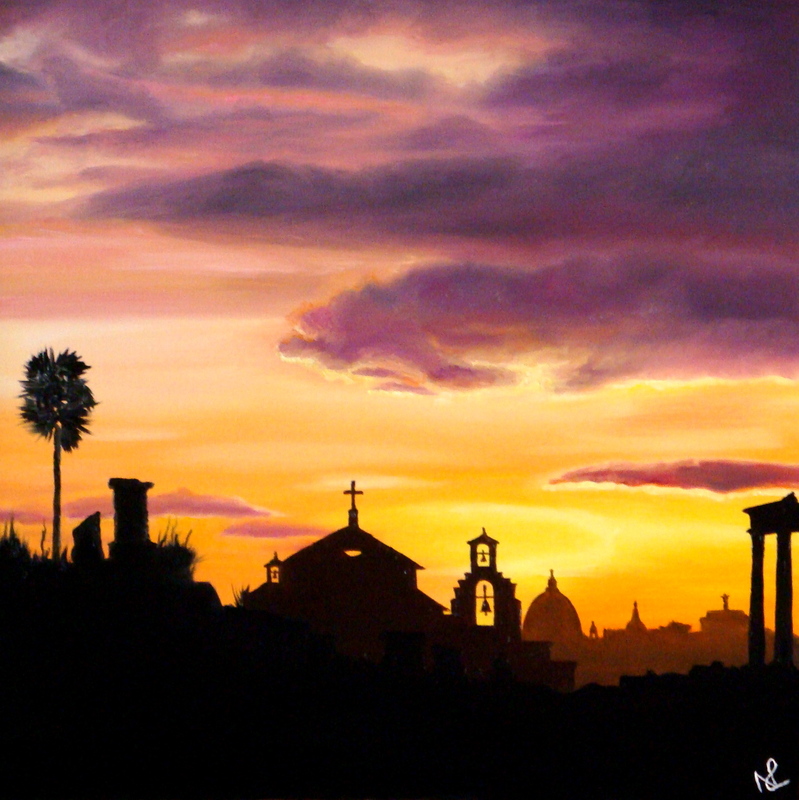 However one work which I did paint in homage to Italy was a simple reflection of Rome’s Forum Romano, against a rich orange and pink sunset. You can just about see St Peter’s Basilica in the Vatican in the background. The painting formed part of my “Cityscape” series which I painted back in 2007 when I was trying to teach myself how to master oil paints, having been painting for so many years in acrylics. Despite being only “studies”, the resulting collection was so popular that I transformed part of it into limited edition prints back in 2008. Anyway, without further ado I give you Rome, in sultry silhouette.